Augmented reality--an overlay of digital data over a real-world display--is one of the new technologies that will change the way we see and interact with the world around us. Layar Reality Browser for Android smartphones is a fun, useful location-aware app with a growing number of third-party plug-ins, some free and some paid, that let you view a variety of "layers" of augmented reality content. These layers offer information on local restaurants or apartments or let you see posts from Twitter or Brightkite that originated from right where you're standing. The first time you use Layar you are prompted to create a free user account. Next, you see a home screen with tabs labeled "Yours," "Local," "Featured," "Popular," and "Search." Each entry on the "Popular" tab represents a content layer along with a brief description of what it does. Press the entry to go to a more detailed description, or simply launch the layer by pressing the "play" icon. This activates your smartphone camera and superimposes the content layer over the screen. As you pan the camera, different icons come into view. Pressing an icon brings up a pop-up with a brief description; pressing the pop-up brings up a window with a more detailed description, a Web page link, a map button, and a "call with phone" button. Apartment search layer for Layar. 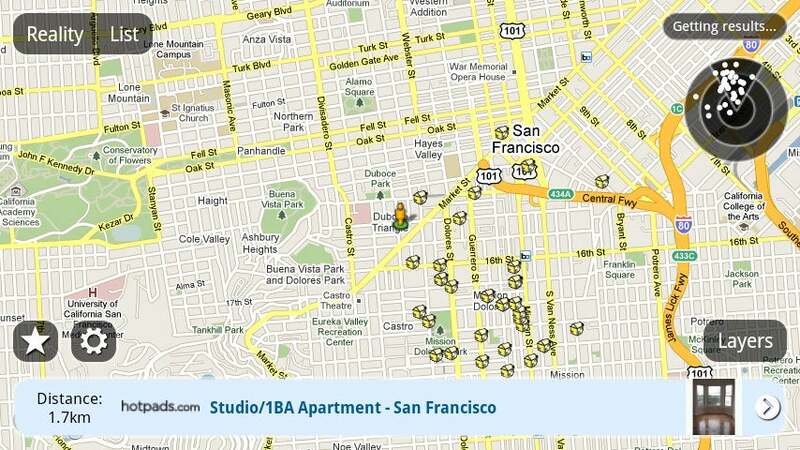 For example, one useful layer lets you search for apartment rentals near your location. You specify things like the monthly rent, number of bedrooms, and area you're looking for. Then as you pan your camera, you will see the rentals that match your criteria as house-shaped icons that you can click to read the details or call for more information. It's a handy way to look around the neighborhood without expending much effort. Map view of apartment search layer for Layar. A wide variety of content layers is available. The main limitation of Layar is that it requires a good data connection. Areas with poor data coverage will leave you frustrated. In good data coverage areas, however, Layar is a fun, useful way to do local search. This augmented-reality app is fun, useful for local search and just plain cool.